Hey!!! Hey everybody. I just finished this book… two minutes ago. And I’m hyped. It was good. Great. No. Brilliant. Just perfect for me. Exactly exactly what I was looking for, and not what I’m usually seeking in a read (you know my usual… super-angsty, tattooed bad boys, rock stars or alpha men). This one had none of those and yet ABSOLUTELY thrilled me and pulled me right out of a slight reading slump. 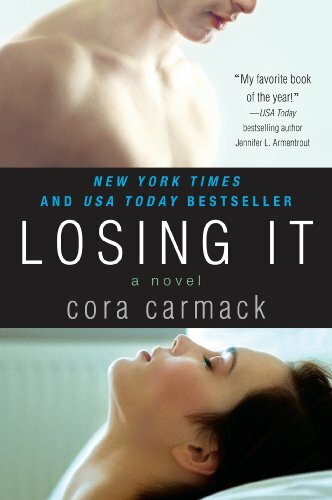 Christy: I just finished Losing It by Cora Carmack and it fits perfectly in this list! Loved it!!! Celeste: I just read Losing It tonight! I loved it! Funny and emotional! They were so right! And you guys? Did I mention this book was brilliant? It had it all. Sweet, lighthearted, incredible romantic tension (steamy but in a different way). A kiss, or a longing stare… a touch… ohhh there was a couch scene that just *wow*. The attention to detail made it so that I was living every bit of it. And I want to thank the author for not rushing through it. Letting us experience every moment. Only a little over 200 pages, but I feel like this book isn’t lacking a thing. Of course… I would have loved it to be longer, but this was just an overall GREAT read for me. Clever and sweet and well rounded. The entire cast of characters (*sigh*... Cade….) the setting, the dialogue, the situations, really allow the story to come together naturally. Nothing forced. None of it over the top. OK some of the funny moments were extra funny ’cause they were a little over the top at times, but in stressful situations, I’ve been known to do some realllly weird stuff, so you know… this worked for me. I didn’t huff & puff or eyeroll once. I clutched my chest, and awwwwwwwww’d, and I whimpered when she did, sniffled, and moaned in agony a few times (out loud!! ), but all of it was real to me. Some angst (just the right amount), a couple of definite tear-jerking moments, a realization, heartache, but lighthearted and fun and just… the whole shebang, ya know? I sooooo needed this. I didn’t put it down once and devoured it in four blissful hours. Okay wait… my husband saw me with my big goofy grin as I was typing and he just asked me what was my favorite part and I smiled and said the end. THE VERY LAST LINE (the epilogue) had me grinning from ear to ear (even more than I was already grinning). Perfection. Absolutely sweet perfection. Just so clever, the author must have been beaming with pride at herself when she came up with that. So he said what was it? And I couldn’t just tell him the last part without him knowing what it meant in context to the story so I started from the beginning and went through it scene by scene… and whoops… he just left and told me he’d let me just go ahead and write my review. Yep. I’m too pumped over this one and I was “and then… and then… and then-ing” him too much for his attention span, it seems. But I have you guys to share this with! So, wanna know what it’s about? Okay off the bat I’m going to say it is reminiscent of one of my favorite books (which everyone knows I am a die-hard fan of and it can never be replaced for me). I LOVE “that book” to death (I’m being cryptic just in case some of you haven’t read the book I’m referring to and I don’t want to spoil it’s surprise, so don’t click the link if you don’t already have an idea of which book I’m referring to). That particular book delighted me with it’s shocking reveal, and will forever be one of my all time absolutely perfect favorites. And you know me, when I find that ultimate book, that perfect story that had me so emotionally connected, I’m always hoping to run across another that might give me that again. Can you blame me? In fact, if I was to start a “What to Read After that book” list (hey…. I just may 😉 ) THIS would be my first choice listed. “Losing It” just gave me that similar warm and fuzzy feeling again. Plus of course, the obvious… the college teacher-student shocker that is just SO fun to explore (and I will say this one is “clean on the steam” factor until much later, but still so well detailed, and so steamy in others ways that I was absolutely in tune with it). I liked him. He didn’t like Shakespeare, and he rode a motorcycle, and he was my teacher… but I liked him. I’m done. I won’t ignore. I won’t pretend or resist. Luckily everyone is an adult in this book (too) so I didn’t have to cringe and I could just go with the flow. And another similarity is that this teacher (Garrick) is also an arts teacher (drama) that used to be an outstanding student himself, who accidentally meets “Bliss” at a bar one night. Before the last semester starts, so you know… they didn’t “know” yet. But once you get passed that, this story takes on a life of it’s own. Best friends, after-rehearsal parties, maybe even a love triangle? And anyway, what kind of triangle can it really be, when a part of that triangle isn’t even an option? His voice turned hard as he spoke. Over? Why did that feel like a punch to the stomach? Okay, I know… even though how I describe it sounds similar, it still becomes and takes on a feel, that is it’s own. So SO good. Please. You’ll see. This was an absolute treat. 4.5 stars. 5 stars? I’m leaning for 5 stars, considering how I leaped right out of bed and still just want to soak in the sweetness that was this book. Sorry about the gush-fest. It was one of those that had me feeling elated and I couldn’t help myself. P.S. Okay the cover isn’t really my thing, ’cause my version of the drama teacher was more along the lines of Alex Pettyfer (British, blondish hair that hung over his forehead, kind of scruffy faced until he shaved… you get the picture 😉 ) and that guy down there looks well… not like my version of the teacher. But still, the inside of the book… Yep!!! Read it! Just bought it. I LOVED, LOVED, LOVED *spoiler*, so I can’t wait to check this out. I finished reading Losing It as well last night. It was a good read! You get me in trouble with you suggestion lists, and book reviews haha, just kidding I love it!!! I agree, I loved this one as well, but teacher-student relationship books are my kryptonite. Seeing your post with the list last weekend made me giddy. I had tackled the majority of them previously, but it did give me a few to add to my TBR. Thanks again!! I just finished, and loved it. It makes me want more…. I don’t think I will ever get through my TBR pile at this rate! A 4.5 almost 5 star book!?!? Yup, this is moving to the top of my TBR list! I loved it! Such an awesome book. My cheeks are sore from smiling so much! Okay, one quick peek at Maryse.net to just “see” if anything good is reviewed on there, you know, for tomorrow, or the next day…something I can read once everything gets done and the house is back in order. DARN IT! THIS BOOK LOOKS SO GOOD and I must read it NOW! Finished this at 12:30 am last night and fell asleep smiling…LOVED this one! Maryse! Such a great start to my Wednesday morning 🙂 As soon as I saw your new posting and the rating you gave, I bought it right away. I am 31% through the book and I wish I can just stay home and read the whole day. It sure had its funny moments there were I was laughing alone in the subway. Thank you for your great suggestions! I can’t wait for you all to get to the end and find yourselves beaming extra hard!! Mind you, I hated “finishing” it. This one was just my thing. Loved it! Reading “Letting Go” now….another good read. I just starting reading it early this morning. I took a break and saw your review. Now I am excited to finish it. The housework will have to wait. Sweet!!!! I bought this book the other day and I’m so psyched to read it! Annnie!! LOL “specifics” – nice!! hahahaha – but yes she mastered that. oh i think the publishers should all give Maryse a portion of their money LOL, i get up every morning and check the site to see what new book to read , my account says amazon , amazon, amazon,:),, anyway already at 40% and loving this book:) can’t wait for tonite to get here so i can finish it..
Wow! It reminded you of “that book”!? It must be really good and it really sounds great. I ‘im gonna buy it. OMG. I loved it. Just…LOVED.it. I could just feel it right along with her. So amazing. I don’t think I’ll ever be able to look at cats the same way again. Lol. Favorite line: He was flabbergasted. That was the best word. His flabber had been thoroughly gasted. YES!!! So many awesome awwwwesome parts. I even felt when she got that virus. That was SOME detail right there, I felt sick right along with her! Tears running down my face I am laughing so hard at this book. Oh my, the cat, great scene. 🙂 I can already tell I will be thanking you for another great book Maryse!!! Sandy – that last line was genius wasn’t it? So subtle, but the perfect ending. Kerri – I LOVED Bliss and her goofiness. I could totally relate to her (even though some of her blunders were out there… still, I got her). Thanks for the recommendatiom. I loved this book! Loved this book!! Can’t wait for Cade’s book!!! Finished it a day and loved it. I wanted MORE!!!! Now I have absolutely nothing to read. I need suggestions ASAP please. Hi Ida! Have you read “the book” I mentioned in the review? it’s a MUST read! I read it before Losing It. I just don’t know where to go from here. I loved Losing It!!! I giggled so much! The whole thing with the cat was just so funny. And I love love it that there is an epilogue from Garrick. It makes him much much nicer and cute and sweet. Not that he’s already all of that. Eeek I really want to read it! But its not available through Kindle anymore?? any ideas? I’m frantically searching for a copy! The book title link and book covers lead you directly to it for Kindle. I hope that helps! I picked up this book the other day. It sounded like it would be good. Can’t wait to read it now!!!! Read it Heather!! I LOVED this one. Sooooo so good! I really hope that she does a follow up book with some of the secondary characters….any word on that happening? Omg!! I loved this book! Anyone recommend some books similar? I kinda of pictured while reading it with JAMIE CAMPBELL BOWER as Garricl. Super delisious to me. Fastest book I ever read, I couldn’t put it down. Yet again I found it because of your blog and spot on review. I’m off to ten tiny breaths…the againagain. Finished this on Friday. It was really good. I also love the fact when you give us the steam rating!! Some of the New Adult ones don’t have much which is fine but its good to know for those that like some steam!! I am totally loving this post, I of course have not read your “favorite” book, or whatever word you used, but I wanted to ask you if you have read or considered reading The Charley Davidson Series by Darynda Jones. She reminds me of Bliss a lot but Charley is much less worried about what others think of her….but God, is she funny and witty. I just have to say, it’s my favorite series, so hopefully if you haven’t read it yet, but were considering it, please do, it’s AMAZING!